Morris Panych’s The Shoplifters premiered last year at Arena Stage in Washington, D.C. (From left to right: Anna Cummer, Stephan Hair, Jeff Lillico, and Nora McLellan). Photo Credit: Trudie Lee. Theft, it’s a victimless crime, at least for veteran shoplifter Alma (Nora McLellan) it is. Because really, in the grand scheme of things, who’s going to miss two juicy cuts of steak? 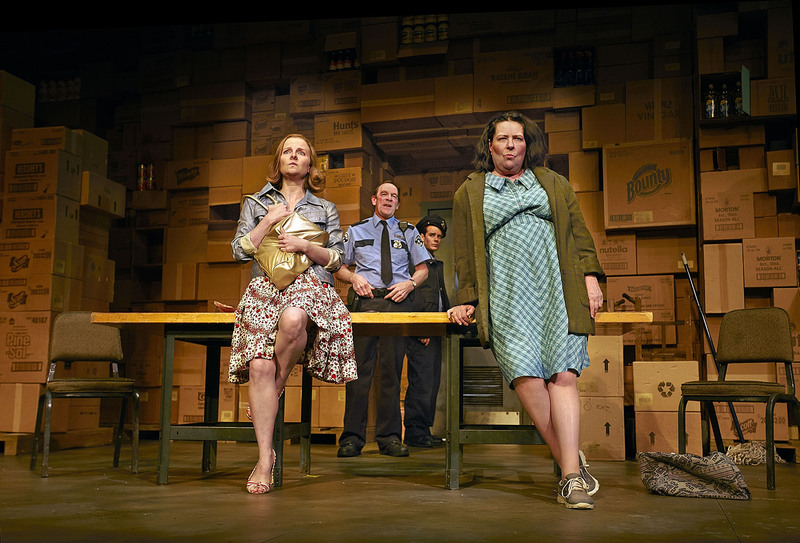 Enjoying its Canadian premiere at Theatre Calgary, Morris Panych’s The Shoplifters stages questions about theft in a world ruled by the almighty dollar. For what is a five-finger discount compared to global corporate greed, the sort of which devastates poor regions of the world? Directed by Haysam Kadri, The Shoplifters sees Alma and her mousy associate Phyllis (Anna Cummer) waiting to be released by security for stealing two steaks. Eager to put away the two criminals, rookie security guard Dom (Jeff Lillico) spares no effort trying to break Alma and Phyllis in hopes of gaining a written confession. Dom’s efforts are in vain, however, when Alma proves to be a worthy, unyielding opponent. Phyllis, who could have spent the day at her unfulfilling job, is not so keen on defying the law any further, risking her and Alma’s release. For boy scout Dom, the law is black and white; criminals are criminals. Dom’s textbook knowledge of the law is challenged by Otto (Stephan Hair), a weathered security guard, who sees things differently. Otto argues that criminals are not always bad people, that sometimes people break the law not because they want to, but because they have to. For Otto, who Dom will be replacing, thinking about the law in terms of black and white does little to help the people it is supposed to protect. As far as Alma is concerned, anyone and everyone at the bottom is being taken advantage of on a daily basis. Everyday, the average person is made a victim of theft by the outrage prices they have to pay in order to satisfy a basic human need. Shoplifting might be wrong, but what big chain supermarkets do daily is even worse. Indeed, Panych gives plenty to chew on, but unfortunately there is little to support his arguments beyond hypotheticals and grand statements. Alma’s acerbic charm is without substance. We gain only glimpses of Alma’s personal history and inner motivations, and rarely are these glimpses made known by her personally. Alma’s elusiveness is maybe taken too far for the character’s own good. And what’s strange is that Panych lets the fact that Alma has cancer float around, rather than pursue that angle in the interest of justifying her worldview. Perhaps the playwright feels that sickness needs no further exploration beyond its initial introduction, that it simply speaks for itself. After developments occur between Otto and Alma, the play looks to Dom as its main antagonist. In order to fulfill that role, Panych has Dom turn from boy scout to religious nut. The character’s fanaticism is exasperating; a joke savagely run into the ground. Really, Panych almost seems to lose interest in what the play has to say just by the way he over stuffs the second act with stale physical gags. The playwright’s sharply written dialogue slides into broad strokes, effectively losing focus on both the characters and bigger picture at hand. Nonetheless, Cummer delights as Phyllis, winning the audience over nearly every time she plays onstage. The audience roars with laughter as Phyllis retrieves an absurd amount of grocery items from under her dress, eventually bursting into applause for what is a genuinely hilarious moment. Set designer Ken MacDonald’s immense wall of boxes is visually striking, and a strong reminder of the imposing corporate influence Alma so very much detests. Ultimately, Panych’s The Shoplifters has difficulty sustaining its big ideas without resorting to over the top, slapdash antics. A weak start to Theatre Calgary’s 2015/2016 season. Theatre Calgary’s The Shoplifters runs September 1 – 27 at the Max Bell Theatre (Arts Commons).